The images of the Tarot deck often depict figures that are half human, and half creature or have both a earthly and a divine nature. This I think is a good reminder of our human state. We are all deeply connected, are no less, or no better than any other living beings on earth. We have a delicate relationship with nature and are all part of the animal and natural world. The Hierophant is kind of a funny looking fellow being half horse and half human. If he actually existed people would either run the other way or there would probably be a lot of laughing going on. This spiritual representation of the Centaur with his beard and long hair, suggests the mature face of a priest and a wise teacher. 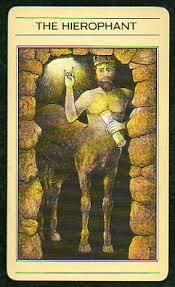 This is Chiron embodied in this Major Arcana card. He is an inner spiritual teacher, an immortal educated by Apollo the sun-god and Artemis the moon-goddess. Chiron affirms the nature of the laws by which we must live in order to be in the right relationship with the divine. Reflecting on the Hierophant, I'm reminded to use three important tools in life that help me to accept and understand my imperfection. The first one being humility, second to be mindful and appreciative of being a part of humanity, and lastly to avoid taking myself too seriously by maintaining my sense of humour. Thank you very much Ellen. Big Hug <3 It was one of the best! Never imaged I'd love being 65 and look so forward to it! I've been well and am grateful for every day. Life is great!